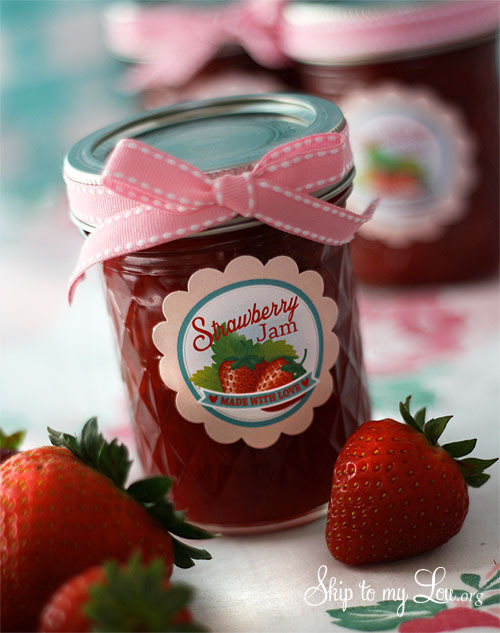 Making strawberry jam is fun and makes a wonderful homemade gift. I love canning and making jars filled with yummy treats. You might like my Onion and Pepper Relish (I think it tastes just like the one from Harry & David). Canned Apple Pie Filling is another great homemade edible gift. 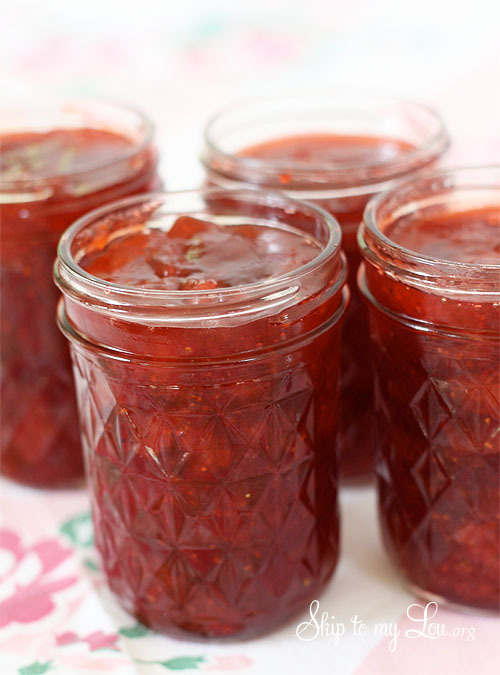 This strawberry jam was whipped up in no time and now it is ready for eating and giving! Making jam has gotten super easy and quick! Old-fashioned jam can be made in about 30 minutes. Look at this baby! 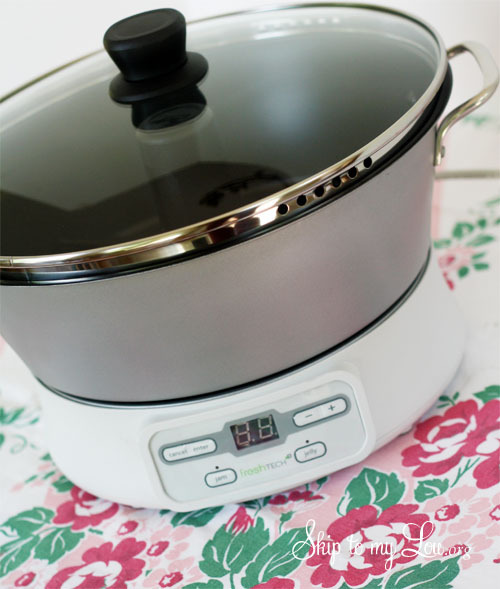 It is the new Ball FreshTECH Automatic Jam and Jelly Maker. It is genius! 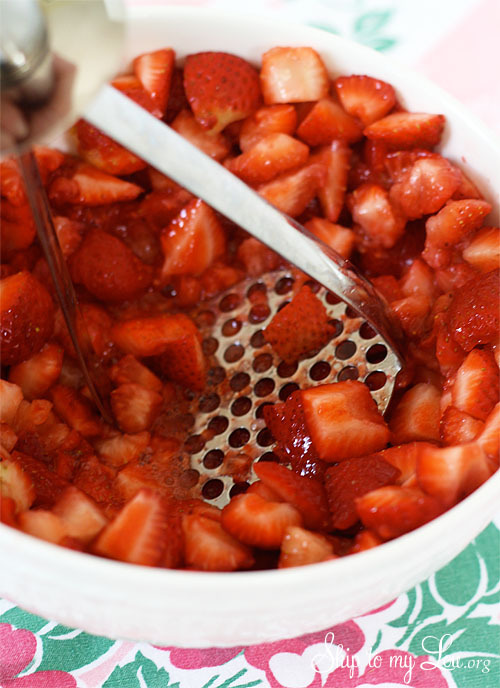 It makes making jam as easy as chopping strawberries. …and giving them a little mash. Add 3 tablespoons of Ball Classic Pectin, 3 1/4 cups crushed berries and 1/2 tsp butter (keeps the mixture from foaming) to the Jam Maker. Turn it on and watch it go. The machine will beep and then then 2 cups of sugar is added. It is as simple as that. This recipe made 4 – 1/2 pint jars. While the mixture is cooking and stirring in the Jam Maker I get ready to can! Of course, a canner is best but if you don’t have one this is what I do to make my own canner rack. I take old canning jar rings and hook them together with wire. Place this is the bottom of a heavy pot. A round cooking rack also works well. This keeps the jars off the bottom of the pot and will prevent the glass jars from cracking. Make sure your jars are washed and kept warm. I put mine in the dishwasher and pull them out when they are dry but still hot. 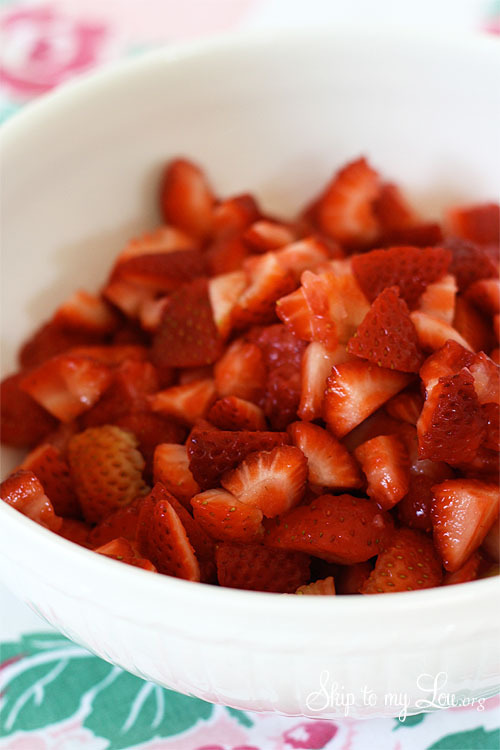 Fill the cooked strawberry mixture into hot jars. Leave 1/4 inch space from the top of the jar (headspace). Wipe the rim and side of jars. 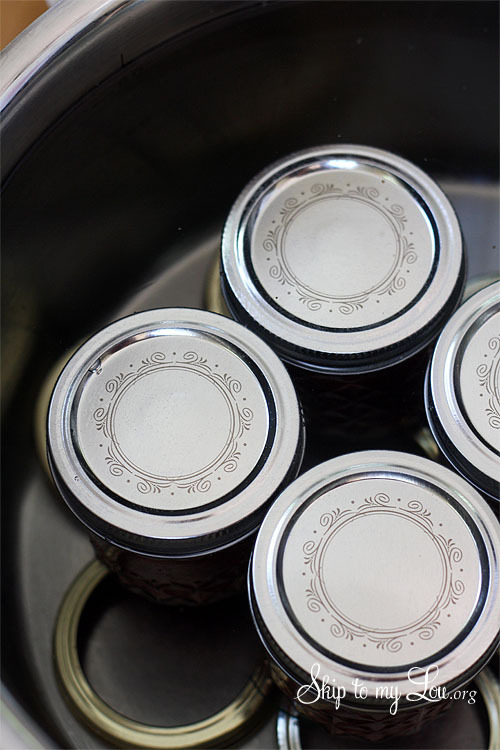 Place the lids on the jars and tighten until fingertip tight. 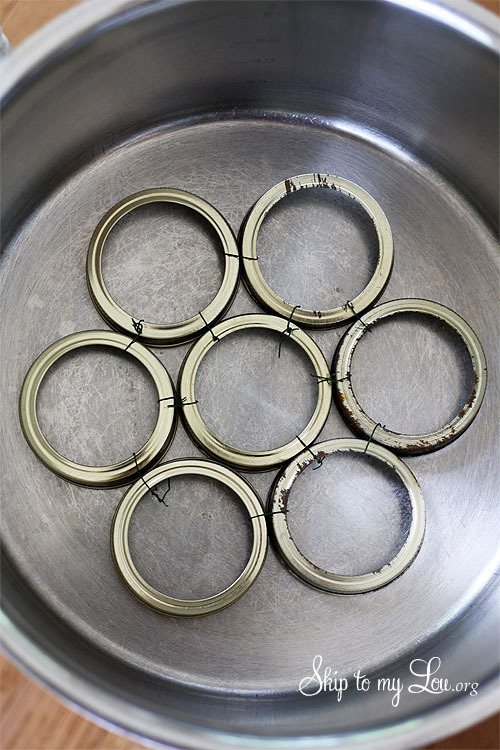 Place filled jars inside the pot or canner, making sure the jars are covered by 1 – 2 inches of water. Place lid on the pot. Boil (process) for 10 minutes. You might need to adjust the time for altitude. Turn of the heat. Let jars stand 5 minutes. Carefully remove jars from the water and allow to cool. You will start to hear the jars make a “ping”. After about 12 hours check to make sure the jars are properly sealed. Press on the lid. The lid should not flex up or down. If it does refrigerate. The sealed jam will last in your pantry for up to a year. It is so yummy though it won’t stick around that long. I put my jars in the oven 250 for 15 min. Is there another link that says who won the contest? I will add it tomorrow. The winner was notified. This really puts a special touch on a homemade gift!! Looks delicious! Would love to gift this if I win:) thanks for the chance! LOVE your labels!! Awesome giveaway! Great info on canning too. I just did a bunch of peach jam batches last month and had seen this new FreshTECH Automatic maker and was so sad I wasn't able to afford one. I sure have my fingers crossed that I'll be the lucky winner because I could sure use this. It's so hard for me to stand to even make our supper and doing the jam was extremely hard. I'd love one of these so I could make jam for my family. Kris, I learned the inversion method (put the jars upside down for 5 minutes and then flipping them), but the recommendation now is to process them. I love canning. I've been seeing adds for this device, but it seems unnecessary to me—just one more thing to store, while the big pot I use has many other uses. My son and I made Raspberry jam from berries we picked at my moms huge raspberry patch. I boiled my jars and lids and kept them in the boiling water till the jam was made. We just put the jam in the jars put the lids on and rings on then waited till the lids "popped" or "ping" and then screwed the rings tight. We didn't process the jam. Ours tastes great and lasts months. Do you need to process jam? We never have. I would love to get back to making jam! I would really use the jam maker. Thanks for all your recipes! Awesome, love anything that makes things easier or less time consuming! Thank you!! I really thought that making my own jam was a lot harder!!! I adore the labels!! I love homemade jams and jellies. This looks so simple! Your resispes sound yummy & the labels are SUPER cute! Thank you for sharing! I love making jams, jellies, pie fillings and so much more to stock the shelves for winter and to give as gifts during the holidays. I put on my apron, turn the music up loud and just get lost in it all. Love those days! It's especially wonderful when my kids want to help. 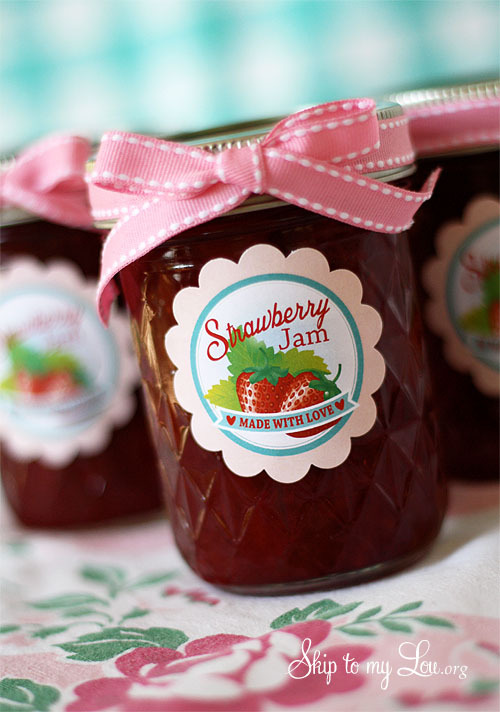 Thank you for the recipe and Printable Jam Labels ! Canning makes me nervous but you make it look so easy!